The PADI Discover Scuba Diving program lets you experience the thrill of diving under the supervision of a PADI Professional in pool or pool-like conditions. 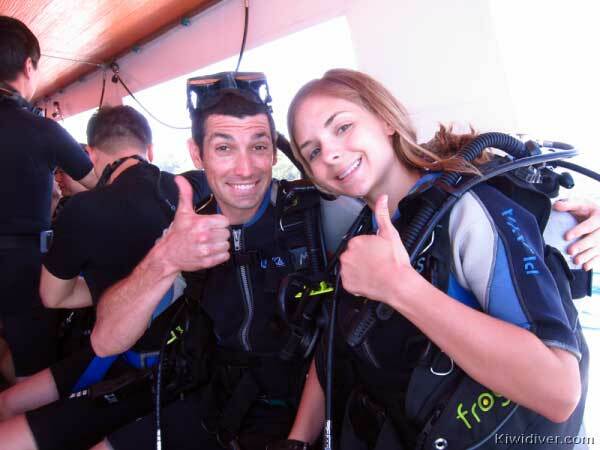 During your adventure, you will master some basic concepts and scuba skills and can even head off to experience an open water dive adventure. At Kiwidiver we have three options available. You can Discover Scuba at the beach (available between late October and mid March). Or you can Discover Scuba from the boat on either a 2 dive trip to Racha Yai or on a 3 dive trip to Racha Yai and Racha Noi. Whichever option you choose take advantage of our free try dive in the pool. 09:00 Meet at the shop to do paperwork, watch a short video and try out equipment sizes. If you would like to make use of our recommended pool try dive before going on the boat we do it the day before your boat trip. 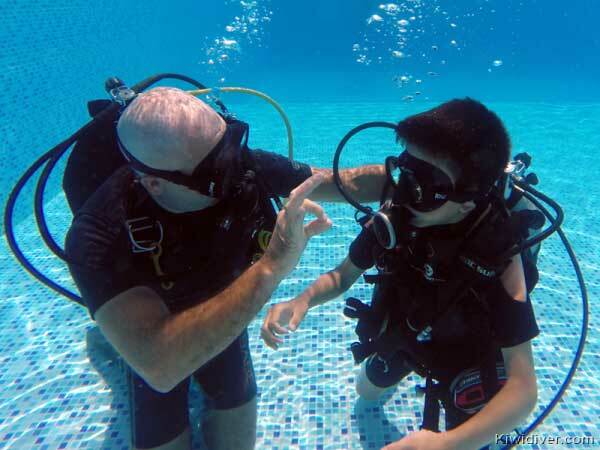 We prefer to start people in the swimming pool on our try dive to learn the core skills you need for scuba diving. Some people however are so comfortable in the water or have already completed previous PADI Discover Scuba sessions and are ready to jump straight into the beach dive. We still do the skills but in shallow water. Then after mastering the basic skills we head to deeper water (5-10m) to explore the reef and meet the fish. Who knows we might even find Nemo. The beach dive sites we use for the DSD experience are among our favorite sites with the possibility of finding some amazing marine life. You will be astounded by the schooling fish and beautiful corals just a short distance from one of Phuket’s most popular swimming beaches. For your Discover Scuba experience, Kiwidiver will take you out to one of our popular island dive sites at Racha Yai Island. You will be thoroughly briefed on how all the equipment works and how to use it under water. We start the dive in a shallow area where you can practice the skills and familiarize yourself with the scuba diving equipment. Under the direct supervision of a trained professional you will then explore the underwater world just as a qualified scuba diver would. You will experience the wonders of the underwater world meeting many fish and beautiful corals. Thailand has many dive sites where we can take you for a PADI Discover Scuba Diving experience. We encourage you to try it out in the pool first wherever possible with our free try dive so that you can gain some experience and get more from your dive. However if time does not permit we can start straight from the boat. The PADI Discover Scuba Diving boat experience is a safe and fun way to experience scuba diving for the first time. Your professional PADI instructor will teach you basic theory and teach you how to use the equipment before guiding you on two controlled dives along one of the local reefs at Racha Noi Island followed by one dive at Racha Yai Island where you will learn to dive at big sandy bays surrounded by coral reef. This way we can guarantee the best level of service and the best safety!